Welcome to Safemeds4all ! We are one of the Best Online Pharmacy offering you drug savings & affordable, high quality prescription medication at the lowest prices ! With your first order at safemeds4all we require information on your medical background, current medications, and drug allergies, to ensure you are not receiving any medication that will conflict with your current medication or allergies. d. Enter your small health profile.
. Answer some of the basic small health questions, this enables our pharmacy team to properly dispense your prescriptions and check if there is any interactions with your medications. e. Create a New account or Log in with your existing account. h. Send Prescription to enable dispatch!. Once you have successfully placed the order, If you have ordered a prescription product, please send us your prescription by Fax on toll free fax number 800-897-1053 or by email at prescriptiondata@safemeds4all.com , once we receive your prescription your order will be dispatched within 1 business day usually. 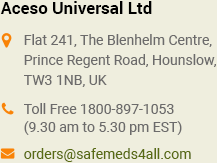 Complete the required fields and promptly email it to orderform@safemeds4all.com, your order will be processed and our fulfillment team will ensure that your products reach your doorstep in time.